SELINSGROVE, Pa. -- Third starting Jason Shultz of Carlise took the lead on lap four and won his first 360 sprint car race of the season and 19th career in Saturday night’s 25-lap main event at Selinsgrove Speedway. Jeff Rine of Danville was victorious for the 109th time in his career at the track in the 25-lap super late model feature. Shultz and Rine collected $2,000 for their victories in the second week of action this season at the speedway. Jake Jones of Hunlock Creek added his name to drivers that have won on the 1/5th mile Selinsgrove Raceway Park inner oval and on the big half mile picking up the 12-lap roadrunner race with a last lap pass. 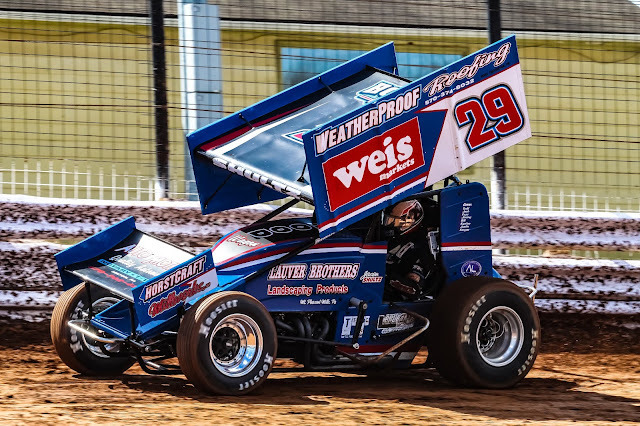 Selinsgrove Speedway returns to racing action at 6 p.m. Saturday April 20, with another four division show featuring the United Racing Club/Keller’s Auto body 360 sprint cars, Jeff’s Auto Body & Recycling super later models and the A&A Auto Stores pro stocks and roadrunners. Track gates open at 4 p.m.
Ryan Kissinger flew around the top of the racetrack to take the sprint car lead. Jason Shultz grabbed second from the second row and they were followed by Jimmy Stitzel, Colby Womer and Derek Locke in the early laps. Ryan Stillwaggon spun in turn three bringing out the yellow flag on lap three. Shultz dove under Kissinger for the lead but Kissinger horsepowered his way back to the front down the back stretch. Going into turn one on the following lap Schultz made the same move but was able to hold of Kissinger for the top spot. Lap eight saw Colby Womer slow on the speedway, bringing out the caution again. Shultz and Kissinger raced the next lap side by side but Stitzel spun in the second turn again slowing the field. The restarts allowed Chad Layton and last week’s winner Kyle Reinhardt to enter the top five. Derek Locke found some speed on the restart and on lap 10 took over the runner up position. By the midway point, Shultz held a second and a half lead while the battle was on for second between Kissinger, Locke and Layton when Locke and Layton got together and spun on the front stretch. With the two front runners going to the rear, Davie Franek and Adam Carberry slid into third and fourth. Reinhardt and Cody Keller quickly got by Carberry for fourth and fifth. Franek pressured Kissinger and got by him for second on lap 21 but was not able to challenge the high flying Schultz who won by 2.86 seconds over Franek, Kissinger, Keller and Carberry. Sprint car heats went to Colby Womer and Adam Carberry. Jim Yoder brought out the caution when he rolled to a stop on the third lap. Rine flew around the top of turns one and two to take the lead on the restart. Chris Casner, Brett Schadel, Meade Hahn and Austin Berry tangled in turn two to bring out the yellow flag on lap six. Hahn, Schadel and Casner were able to rejoin the field. Rine again took off but last week’s winner Coleby Frye was soon in third right on Snyder’s tail. Frye grabbed second coming off the fourth turn on the high side. Cody Lyter stopped on the track wiping out a 3.9 second lead for Rine and put Frye right on his rear bumper. Rine slid high in turn three allowing Frye to get inside him. Frye slid up and got into Rine but the pair continued down the front stretch. Dan Green’s car quit in the third turn on lap 21 setting up yet another Rine, Frye restart that didn’t happen as six cars piled up in the second turn blocking the track, bringing out the red flag. No drivers were injured. Another three car incident on the restart kept the field under caution. Rine ran the rest of the distance out front winning by 3.7 seconds over Snyder, Jones, Trevitz and Schadel. Late model heats were won by Jim Yoder, Dan Snyder and Dave Stamm. Kyle Bachman grabbed the pro stock lead from the pole and then just about spun in the third turn. Bachman held on but it allowed last week’s winner Brandon Moser to take second from Shaun Lawton, Corey Long and John Schoch. Late in the race Moser drew to the back of Bachman when the caution came out for Lori Croop on lap 13, setting up a green, white, checkered finish. Bachman ran the rest of the distance with Moser and Lawton on his tail but held on for the win, by .452 seconds over Moser, Lawton, Long and Schoch. Will Brunson took the roadrunner lead followed by Jake Jones, Curtis Lawton, Brian Mabus and Terry Kramer. Jones pressured Brunson and took the lead on lap three. Brunson stayed right on his tail as the pair raced away from the field. Brunson got back in front on lap nine when Jones slid high in the second turn. Coming off the last turn Brunson slid high and Jones regained the lead for the win. Lawton, Kramer and Mabus rounded out the top five.